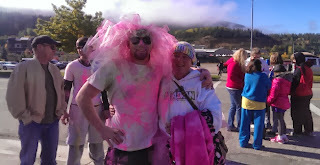 This last week I ran in my first Color Run. I have seen pictures of Color Runs from around the country and thought this was the last thing that I would ever want to do. Last night I was thinking about the first 5k I ever ran but it just wasn't clear. A memory of running in one cross country race seemed to come to mind but then I never joined the cross country team. That was not for me. In 9th grade I was on the track team and ran the mile race (always came in last but had a blast just being on the team). It may have been a US Armed Services run in Seattle where they were giving away Gloria Vanderbilt Tshirts to the top 200 finishers. I showed up and it was a miserable day. It was cold and raining and looking around the crowd that was assembling. It looked like all I would need to do was to keep running and I had a good shot at getting one of the tshirts. At the end of the day I was soaking wet and pretty cold but I was stylin' in my new Gloria Vanderbilt Tshirt. It may have been at that point that I began my lifelong love of running for the Tshirt. Since then I have run in several Bloomsday runs, the Bay to Breakers 10k, Crater Lake Rim Run 10k, Baltimore Marathon 10k, Dubai Marathon 5k, and an assorted other events (as long as the Tshirt was awesome). But when I saw my friends signing up for a Color Run I thought that was just about the dumbest thing I had ever seen. This all changed last week when I showed up to run for my friend Vicki. Because I adore her I joined in with about 200 other runners who showed up from our very small town to run the 5k route and have colored chalk (or whatever it was) thrown at me. Not only was it a good cause and a beautiful day but it was also a TON of fun. I wore my favorite white hoody and now it is covered in pink, yellow, blue, purples, and green. Apparently, I could toss my fav hoody in the wash and these colors would all but wash out. OR I can iron the shirt before washing and the colors will have a better chance of setting in. I am choosing to iron the colors so they stay. Thanks go out to Silver Mountain for sponsoring such a fun event. October is breast cancer awareness month and I have already had too many close personal friends affected directly by this terrible cancer. So get out there with your friends and live life to it's fullest. 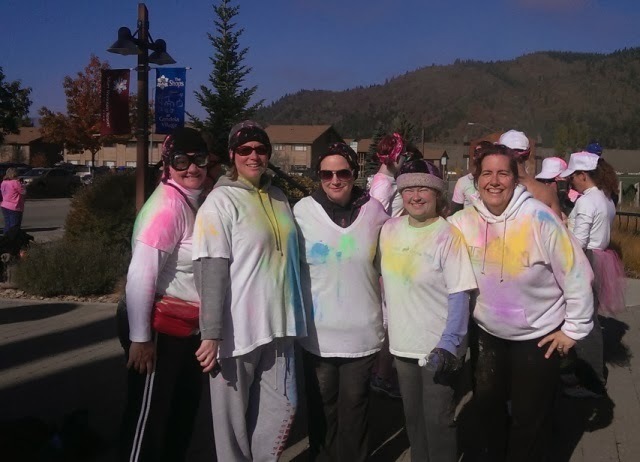 Join in a run, eat some SunChips, sing a song, go to the beach, or have someone throw a bunch of color on you as you run along with your friends. Like the Color Run I used to think some of these feel good events were kind of silly and not necessarily the best way to actually help my friends and those people I don't know who are affected by cancer. Now after seeing the smile on Vicki's face the day of the race I know that there is hardly anything better that we can do. Mary, Thanks for sharing your thoughtful experience.